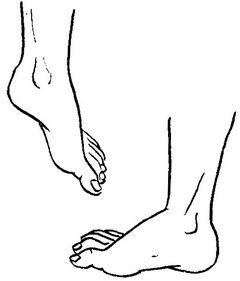 When this defeat comes disorder sensitivity, developed paresis or paralysis of muscles with dangling feet (Fig. 48),. hip rotates outward, violated movement in the hip, knee, and in more severe cases, and ankle joints. The affected limb is placed in Paris splint is placed from your toes to the upper third of the thigh, in the correct physiological position at right angle in the ankle joint. Therapeutic physical culture appointed in the form of passive and active movements from the first days after the defeat. The lessons are conducted 6 - 8 times a day, once a day doing massage. During lessons a leg removed from the splint. Pay special attention to walking with two support systems (crutches, sticks), correct the load on the leg. Once restored the function of the knee joint (leg will not fold over the knee joint), Paris splint is placed remove, and stop if it hangs, locks orthopaedic Shoe.